If you love both jewelry and fragrance, then this is the giveaway for you! 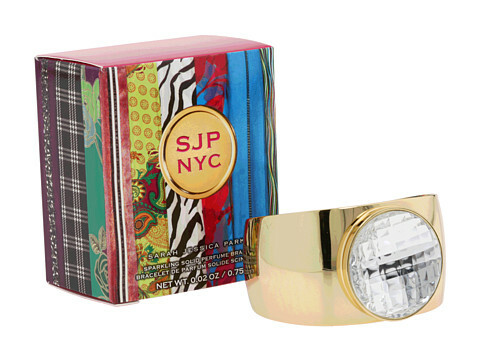 One lucky winner will receive the Sarah Jessica Parker SJP NYC Sparkling Solid Perfume Bracelet, valued at $35. This glamorous gold cuff is accented by a gleaming, glittering faceted jewel and contains the sweet-smelling SJP NYC fragrance in solid form. The fragrance contains notes of wild red strawberries, Italian mandarin, white osmanthus, gardenia, honeysuckle, mimosa, rum flavor, sandalwood and creamy musks. Entering is easy. All you have to do is enter your name and email address in the box below. The winners will be selected on Thursday, June 17 and notified by email. It's that simple! This giveaway is open to US residents only. Giveaway runs until Wednesday, June 16 at midnight. One entry per person, email address and IP address. Multiple entries will be disqualified.